Tom Cruise’s sci-fi action romp Oblivion proved this weekend that the movie star still has the draw despite a film not being that well rounded. And according to numerous reviews, Oblivion looks great but fails to stimulate the mind. Typical of a pre-summer blockbuster. However, the film – which debuted this weekend – managed to still pull in a nice $37M. It’s Cruise’s largest opening since 2006 when Mission Impossible III released. 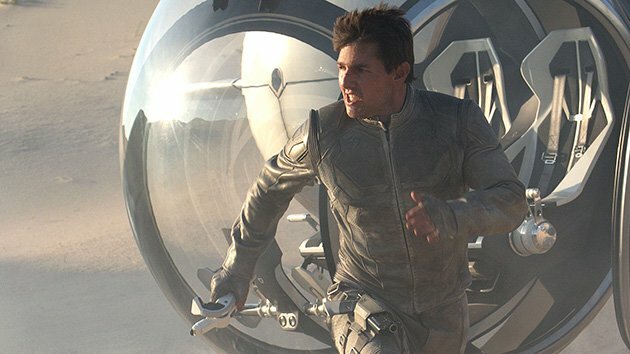 Oblivion will likely remain atop the box office until May 3 when Iron May 3 launches. Second at the box office this weekend was last weekend’s box office winner, 42, the biopic of Jackie Robinson. The film continues its strong two week run with nearly $18M, bringing its two week total to $53M. Considering the film has already made back its budget it’s really a great feat. Third this weekend was Dreamworks’ continued successor The Croods, which pulled in nearly $10M to bring its total to $154M. It’s officially Dreamworks biggest hit since Madagascar 3 last summer and is poised to move into Dreamworks’ top 10 all-time grossing films. Rounding out the top five was the abysmal Scary Movie 5 and G.I. Joe: Retaliation, which made $6M and $5M respectively.